Angel Number 555. What's The 555 Meaning & What You Need To Know! Angel Number 555… What’s the Meaning of 555? Whenever you repeatedly see a number sequence, there is a good chance it contains guidance from your angels and from the realms of spirit. But don't worry if you're not yet seeing number sequences because numbers are simply one of many signs and signals the angels use to communicate their guidance and illustrate their presence in our lives. The reason I am writing about so many angel numbers on this site, like 333, 444, 222, and 1111, is because the angels are bringing these numbers to so many people's attention. Why Do The Angels Communicate Through Numbers? Numbers are a simple and straightforward way for angels to deliver messages that aren't filtered out by the ego mind. With awareness, and by tuning into the vibrational meaning of numbers… You can learn to decipher and receive the guidance from the angels present within the numbers you're seeing. So, when you notice a number sequence at a synchronistic time, or you keep noticing the same number repeatedly, pay attention to what you're thinking about and what is happening around you to help you decipher your message from spirit. Have you been waking up at 5:55 or looking at the clock right at 5:55 in the evening? The point here is, it doesn't matter where you're seeing it… But rather, if you keep seeing 555, there is a message for you from your angels. So what is the message? Like this video? Subscribe on YouTube! What's The Meaning of 555? 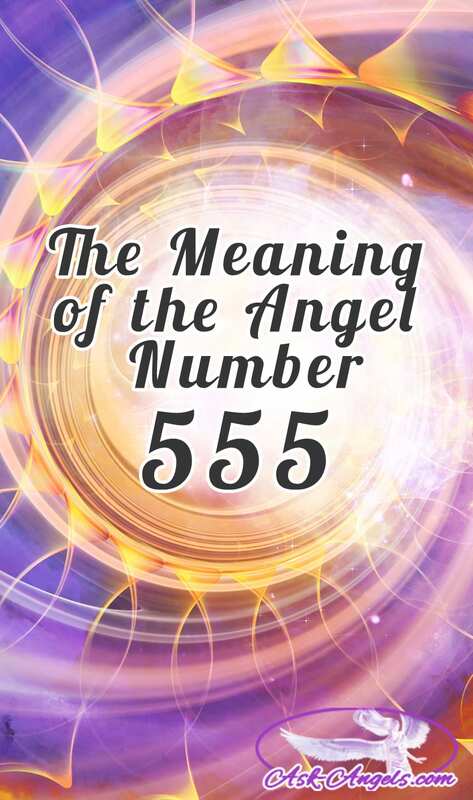 Which when it comes to 555 is first and foremost, a clear sign from the angels that huge changes are unfolding, or are about to unfold throughout all areas of your life. If you keep seeing 555, you’ve likely already started seeing changes unfolding around you, and it’s highly likely there are more to come. 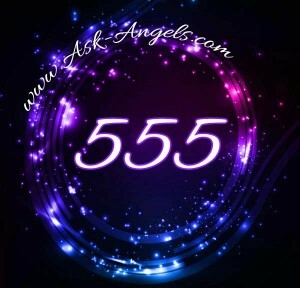 555 is a sign of positive changes that are bringing you into greater alignment with your soul purpose, and with greater love, vitality and abundance. The angels are showing you this number not to worry you, or frighten you about the upcoming changes… But just to help you become aware, so that you can keep your thoughts positively aligned. Staying focused on your intentions, and maintaining a high vibration, even raising your vibration, will help the changes that are unfolding in your life to do so in the most positive, rewarding and fulfilling ways. But for this past week I've once again been seeing 555 everywhere! And yes, 555 signifies the energy of change. Releasing old fears, past patterns, and all that is no longer serving you. Because when you're willing to release the old, you make way for lighter, more positive, fulfilling and uplifting patterns and possibilities to fill your experience. 555 is also about life choices. Rather than making choices to fit in, or because other people think you should choose a certain way. One step at a time aligning more fully with your highest soul truth, freedom, and authentic vibration. And that there are big changes in store for you. But you're meant to be an active participant in them. It's a call for you to positively change your life in an uplifting and empowering way. Rather than a warning that the rug is about to be pulled out from under you. And keep moving forward on your path one step at a time. If you're seeing 555, and noticing lots of change in your life, you can rest assured that the changes, even if they may seem harsh or sudden, are Divinely inspired and are ultimately bringing you into closer alignment with your authentic self and your life purpose. 555 urges you to let go of the old and outdated. If you resist the changes happening in your life, you'll likely manifest obstacles, challenges, and a feeling of struggle. But by willingly letting go of what has been, and what is now in the past, and refocusing on the infinite possibility before you, you'll naturally bring yourself into alignment with the divinely inspired positive changes in store. 555 isn't a call to sit back and be a passive recipient of whatever is coming you way. It is a call from the universe and the angels to choose yourself and to co-create positive change and blessings in your life. Stay present in the moment and utilize affirmations, and prayer to stay positive and to stay focused on aligning with the highest and best possible changes, which will most serve. You're well equipped to handle whatever change is coming, and hugely supported from your angels and guides beyond the veil. Trust in the process of change, choose to stay in a positive state of love, and be willing to let go and go with the flow to allow blessings and divinely inspired changes to unfold in your life. Keep learning about the meaning of seeing number sequences, in the Complete Guide to Angel Numbers here! Or, if you would like to learn more about the vibrational meanings of numbers, including what the numbers in your name and birth-date say about you? Get A Free Numerology Reading when you click here! Learn about additional angel numbers below! If you’re on a phone/ tablet, or to view a bigger version of this image… Click Here or Click the Image! Want to share this image on your site? Simply copy and paste the code below and be sure to include the link to this post! Angel Number 888, What Does 888 Mean? 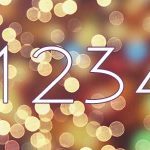 Angel Number 1234 and 123 … What Do They Mean? I have just been diagnosed with breast cancer. Yesterday my mobile phone went crazy and everytime I picked it up there was 555 typed as if I was either sending a text to someone or it was in the Google text box. This morning when I switched my phone on it opened onto this website. I am not kidding!!!!! Where is any biblical scripture on any of this number meaning angels??? This was very helpful. I have been seeing 555 all the time lately. I left a marriage of 27 years about a year ago. It was not a good marriage and I have spent the last year just trying to be me again. I know i have to go further now and it seems 555 is telling me just that ! Thank you for the information. is it weird that I see 5:55 on my clock every single day. Thank God i have been looking for this! Thank you Melanie for posting. I’ve been seeing 1111 for so long, then 444 now it’s 555 and it was all so timely messages from my dear angels that I’m deeply grateful for. I thank you kindly for sharing this info that helps me understand somehow and relate this to what’s actually happening in my life. May God and the universe continue to bless Us All! I dont see one specific set of numbers only I see different numbers all the time…it may be like this 555, 1010, 1212, 222, 444,555, 1111…all in one day. Why so many different…but it’s primarily when similar events are happening in my life. I have been seeing this as well. My girlfriend and I had a very close relationship since meeting last year, we went to Venice together and did lots of things felt very much in love and happy. A few months ago she lost her mum to Cancer and moved house immediately after and everything has been crazy busy with her fixing up the new house with me helping her. No signs of problems. We went on holiday together and she seemed down at times then the day after getting back she told me that she wasn’t feeling it for me and wanted to split up. I was gutted and have been looking for inner guidance ever since as I still love her and want to help her through the hard times she is facing but instead have to give her space. The split came out of the blue totally and the weekend before the holiday we were still making plans together and she added me to her car insurance. I have been seeing 555 and other triple numbers everywhere for months and trying to find the meaning, I know it shows major change in my life and I can only hope that the changes will be positive because it is difficult to see at the moment. When i look up the #’s i see unexpectedly like 111, 222, 333, 444, 555, even 123, they all say roughly the same thing. 555 is a “Pythagorean Number” because would you believe, 333 ‘sqd’ (i.e 333 x 333) + 444 ‘sqd’ = 555, ‘sqd’! 444 was predicted by Edgar Caycle as the “APOTHEM” and MIR measure, in one side of The Great Pyramid. This links the other Angel Numbers you mention and see: the above website, for 555’s Power for change. ive been going through rough times. lost my business and have to vacate my apartment. my mother is buying my grand mother a home and would like me to live there as well while I start over and find my path. well we have been going back and forth between homes and finally we are fighting to get the one we like. today i was looking at the home online and noticed the address starts with “555” i never noticed this, but now that i do, i can see that this house is a new buying for me and s start to big change. thank you for the info! Ummmmm Yea I keep seeing 555… On this website. Should I be worried??? No way! Although we humans tend to fear the unknown, stepping into change is a beautiful and positive thing! My My My. Last Saturday I happen to look at the clock on the stove which I always do then looked at the clock on the microwave which is usually 2-3 minutes off. This particular day both clocks were smack on 5:55. I had to double look at them both. For a second I was amazed at them being the exact time. I do notice changes happening in my life financially, spiritually and just starting to make changes for my overall well being which is starting to put health first. I’ve started making plans for something different. I don’t know exactly how different but different. About 2 weeks before seeing 5:55 on my clocks I was cleaning out my life of everything and everyone did not bring value to it. Unfortunately that had to include some family members as well as some friends. I have started to feel better about where I am and where I’m going in life. I feel as though there is nothing that I can’t achieve. I thank you for this posting. It definitely fits my life to a T.
I dreamed very clearly 555 – in a early morning dream a week or so ago. It was so clear – like looking at 3 big billboards or giant cards each with a simple 5 on them. It struck me on waking because I’ve never dreamt like this before, however I have been thinking of my angels a lot lately especially in meditation. I too see 555 a lot. Heck, even the Washington Monument is 555 ft high. 5 is the number of the world. We have 5 fingers and toes, 5 colors in the world, 5 senses. We even have 5 different colors of people in the world. I could go on but I think you get my message. This is so incredibly fitting. My soulmate, who I am not quite with yet, has been seeing this number in the most bizarre situations. After reading a persons meter (555 of course), and then totalling up the bill (£555), and sending messages unknowingly to me at 5:55 we are now so sure that this is our path, and that the obstacles keeping us from being together are ready to be overcome. I thank you so much for sharing this article and for reinforcing our belief in the universe. OMDog!! I just left a comment on the “999” page; I had asked my higher guide(s) for help in a rapid and massive change in my lifestyle, then saw 999 after having seen 222 then quickly saw 333 earlier. So 222 (keep going through the duality), 333 (we’re with you, you’re growing), 999 (the cycle is closing). I wrote to my power: “I hear your 9’s…can you tell me what to prepare for?” The answer was inadvertently about 3 stars. I was thinking earlier today that I am certain, not just “strongly suspecting”, that my spirit came from the Sirius triple star system. I am haunted by the numbers 173 and 51 (17×3=51). My go to system is the Tarot, so I think “3 Stars” and have recently affirmed (seen confirmed) my thoughts about being a “Sirian starseed”. I was thinking this earlier and immediately after saw the time 5:10. So that’s background. I went for a walk (with my Dog) and get back and feed him. I go to put music on and a video comes up for the artist Grouper with a song “Alien Observer” and the pick has 3 very bright lights on a black background with 6 smaller stars. That’s 9 stars total (had seen 999 earlier). So “Alien” and a pic of 3 stars just after already having “seen” affirmed my thoughts about the triple star system Sirius (the “Dog star” at that). Unbelievable. I go to feed my Dog and the time is 5:55. Jaw dropping! What is 5 but EXPANSION in the tarot, then I read on this site (this site has my favorite “angel #” interpretations) that 555 is indeed about super rapid change. But also about letting go of the past to make room for the future. This last thought would have slipped out of my mind, but the next song that RANDOMLY played as I typed that sentence was the song “Sober” by Tool (which came right AFTER a music video in which the character gets completely painfully intoxicated, this alone is a startling sync) and the line “but the past is done” played at that exact moment. It is 6:09 as I type this (yin and yang separated by space?). Every single PARTICLE around me is a synchronicity right now. This is just the surface, here is what truly startles me: after the 999 I was looking into Sedona, wondering if the energy vortexes will resonate with my active but stifled Kundalini that happened two years ago (Where’s “Jedi school”????). The link exactly next to the 555 link on this page……. was about the Sedona energy vortexes. Wow. And, wow. I want to live in synchronicity, I want to master this language and become fluent in it. I believe it is the voice of “Dog” itself speaking to us through the “Tao” lifeforce. If you are seeing numbers and other syncs, you are a blossoming spirit and I love you immensely. Namaste, thank you for reading these words. It helps me immensely to express them. Hi there! Thank you so much for your informative article on angel numbers. I’ve been seeing this number a lot lately and am rather spiritual and thought it was a message. I looked up the meaning and here I am ? This information seems very true for my current situation. I lost my way in life and came off my path a little. This past few months I’ve been so focused, positive and making better choices for myself. I’m smiling again and nourishing my body, mind and spirit. A massive opportunity has come for my career and I’m incredibly excited as it could bring big things. Reading your article is confirmation that my positive choices and changes have, and are being supported by the spirit world which makes me feel elated. We are never alone ❤ Thank you so much. Love and light ? SO glad to hear Rebecca! Many blessings of love and light as you continue on your path of creating positive changes in your life. 555 means Ha-Ha-Ha, laughing ! (5=Ha) and young people use it often! I just left a comment on this page, and the screen randomly scanned down here. I read something in another window that made me cry, happily, and I laughed it off. Then immediately (within a second) click on this page and read what you said. I will remember this with pleasure! I have been seeing 555 for a few years now. My life is changing dramatically and for the better! So glad to hear Debra! Keep focused on your intentions to continue manifesting the highest possible changes in your life. I keep seeing the number 555 on clocks all the time. Would be nice to know what changes are coming. I see 555 and 333 all the time on clocks in change back once it was on my car clock and my mile odometer at the same time I even will see it in books etc. Yes, this is exactly how it works when the angels want to bring your attention to a number!! it is all about numbers they are a key and angels and guides give them to help you on the way always listen to them thy are here to help us the old government is collapsing and we need this for the change trust,love, and never fear. Yes I have been seeing multiple number sequences for a few years. Never 555 or 444 but mine are ALWAYS 911 and 1118. I have emotional connections with these numbers. Deep loss of 911 and my birthday is 1118. I see them multiple times a day everyday! Could there be more to them?? Nice article, but I would like to ask you one question. What if is I see 23555124, is the number considered as a angel number or only pure 555 or 5.55 is considered as angel number? Ok I have seen 555 off and on for about three to four months now and nothing good has happened yet. I see these number’s on just about everything, on my clock,phone,the stove clock and on my coffee pot…. I started playing those numbers on the missouri lottery and it has not fell yet this year. I have been trying to figure out what threy mean and I appreciate the information…. I will try the thing’s that you said to do and see what happens and I will let you and everyone know whst happens after if I continue to see the number’s 555…. I have been seeing the numbers after i had begun with meditation and i found it was weird. Becouse i saw the repeating numbers all the time. Then i had an insight or a sound ” someone who don’t talk in words wants to communucate” and i had googled maby wat the numbers are meaning. I am so amazed that are so much people around the world have this. Every time it comes with a feeling and even a talking sound and the numbers are appearing, they are always right. I had insight 2 days before my near death experience (i knew it would be happened anyways) and after that (15 months now) it goes only up! I cant tell it to anyone the other people finds it is very weird or incorrect. The other abilites that i have since i know myself.If i meditatie and see (is it be a boy of a girl, what will he or she being named, sycronisation (the dream that my wife sees, see i too at the moment, seeing strange areas with insect looking big extraterrestrial and little helpers, finding a lost place expl. a grave or a house of a lost dog. and 111, 1111, 444. 1212…non stop. And today I was shedding tears from painful memory and I saw 5.55 in digital clock. Yes, I will let go of the old. I am more than ready for new chapter and new changes. Oct 10th 2014 I dreamed. Entering a school, I got a number as important as 666, which is 555. In this scene, I was entering a school with some others friends which were quite many. On the field of the school, while we were waiting, suddenly one of them, a man, got into the office room and took something. Next, he showed me a number and said: “555”. It’s a number as important as “666”. Then the dream disappeared. Thank you so much for this insight! This is amazing. It’s exactly clarification of what I have already been feeling and seeing. This makes me so much more joyful and hopeful. Merci pour l’interprétation. Effectivement, je sais depuis maintenant 1 semaine qu’un grand changement va s’opérer dans ma vie ( 1 de plus! )et je suis CONVAINCUE qu’il s’agit d’un coup de pouce de là-haut! Et il y a 2-3 jours, pour la première fois, 555 est apparu sur mon réveil 🙂 . 333 has been everywhere for me for many years. I wish I knew what it meant. I almost always see the #’s 911 or 1234, most always on the clock. I really think it has a meaning for me, but I don’t know. My birthday is 10/01/1964, what do you see, good or bad is fine. The #5 has always been my number. I notice 5’s all the time, everywhere. I am 61, going through unbelievable changes in my life. I have, in the last three months HAD to let go of many family members and friends who were toxic to me. After 3 mini-strokes in 2013 my doctors told me I must reduce the stress. After 28 years of therapy I have finally accepted that I have to let go of things I cannot change. It is a frightening time for me, yet at the same time it is like a burden has been lifted and for the first time, I feel an inner peace and HOPE!! I look forward to what time I have left being happy!! This post has helped me tremendously. Thank you so much! I find great guidance in your messages. I often see 777, 888 and 999 ……… what does it mean ? Arcangel Michael has a special message for me. What does it mean. Will my husband live? Well a few years ago I kept seeing the #55 alot and we had to relocate because of a job, our new address has the two 5’s in it. Now I am seeing it again and I am a little frightened of what it means as there has been a few changes made again thus far and do not know where it is going to lead us. Trying to stay positive though. Thank You. I have seen 666 so often throughout my life! It gives me a fright every time I see it because in the Christian community it is seen as the number of the Devil,although I don’t believe in a Devil and I’m not a Christian but a free spirit and believe in Angels,reincarnation and karma I don’t understand why the number 666 should frighten me!